* jaripeousa.com DOES NOT collect any credit card and billing information from our users. Information Collected Automatically: jaripeousa.com automatically collects certain information, such as your IP address, browser type, domain name, access times and referring website address. What do we do with collected information? We use the information we gathered about you to perform statistical, demographic and marketing analysis of users of jaripeousa.com and to generally inform advertisers about the nature of our users. The information we gathered about you help us to better tailor our content to enhance your experience of navigating jaripeousa.com. What control do our readers have over their personal information? You may unsubscribe to any of our online e-mail updates or newsletters by following the unsubscribe instructions in the body of any e-mail message. You may unsubscribe to any communications from Third Party Partners by following the opt-out procedures contained in the e-mail or written communication sent by the applicable Third Party Partner. COPPA Compliance: jaripeousa.com does not collect or store any personal information about children under the age of 13. The content of our site might not be suitable for children under the age of 13, and which are not necessarily monitored. We encourage all parents and legal guardians to talk to their children under their care about online safety and monitor their children’s use of the Internet. Comments: jaripeousa.com allows Facebook comments on the site; however, jaripeousa.com is not responsible for comments made by users on the site. jaripeousa.com will try its best to moderate any lewd and inappropriate content made by users. 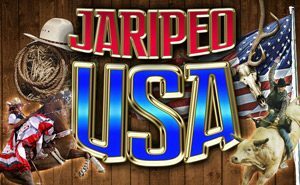 International Users: jaripeousa.com is hosted in the United States. If you access jaripeousa.com from any other region with laws or regulations governing personal data collection, use, and disclosure that differ from the United States law, please be advised that any information you provide on our website will be transferred to the United States. By visiting our site and submitting information, you authorize this transfer, processing and use.